Submitted by Kelly McGraw on Fri, 08/22/2008 - 4:26pm. Submitted by Scott Groll on Sat, 05/03/2008 - 3:10am. I'm so happy to have stumbled onto this page! Lester Picker was my grandfather's first cousin. He was born December 26, 1905 in San Francisco and died in Los Angeles on May 10, 1930 from complications due to his infirmity. His younger sister, Sylvia Picker (1909-1981), was an actress, mostly on radio. The family moved from New York to Southern California because Lester's father Herman had tuberculosis, and needed the dry climate. He died anyway in 1924 at age 44. After Lester died, he was returned to San Diego for burial next to his father. Submitted by Zoreo on Sat, 01/26/2008 - 4:36pm. On the large photo you can clearly see a telegraph key on top of the receiver. These were used to send morse code transmissions and those wires hanging down connect to this key and I suspect go to a transmitter in another room since transmitters in those days were quite bulky and would be too big to fit on the table. Submitted by Sid Morrison on Wed, 11/14/2007 - 4:18pm. Here's a QSL he sent in 1925... Some notes on his antenna on there too! Submitted by Sid Morrison on Wed, 11/14/2007 - 4:11pm. What license classes were each of these? Submitted by Ham Radio Curmudgeon on Sun, 11/11/2007 - 4:30pm. Excellent info, Dave. Thanks for clearing up all the mystery. Submitted by Dave on Sun, 11/11/2007 - 12:53pm. SAN YSIDRO, Calif., March 10 — There is not an amateur up and down the Pacific Coast who will not cut in and answer when he hears amateur radio station 6ZH calling. These call letters, meaningless to so many radio fans, have a deeper significance in the hearts of dot-and-dash amateurs. They know that 6ZH is the only one among them who has the right to be lonely. “How are things tonight?” they say. Sometimes they pause for a lengthy chat. Their reward, though unseen, is a smile lighting up the face on a pillow thousands of miles away. Down on his luck, but what of that? — 6ZH Lester Picker, District Superintendent of the American Radio Relay League, has brought the whole world to his bedside and you will find him there in the evening with his chin up, talking to his pals of the A.R.R.L. along the coast. He knows most of them, the amateurs, from Vancouver to the Gulf and now and then he will seek out an old friend to the banks of the Mississippi. There is fun in distance when you measure your own movements by inches. If there is anyone who can get action out of his [illegible], Picker and his signal is like the crack of the whip. There is much to take into account, of course, if it were not for amateur radio in the first place. 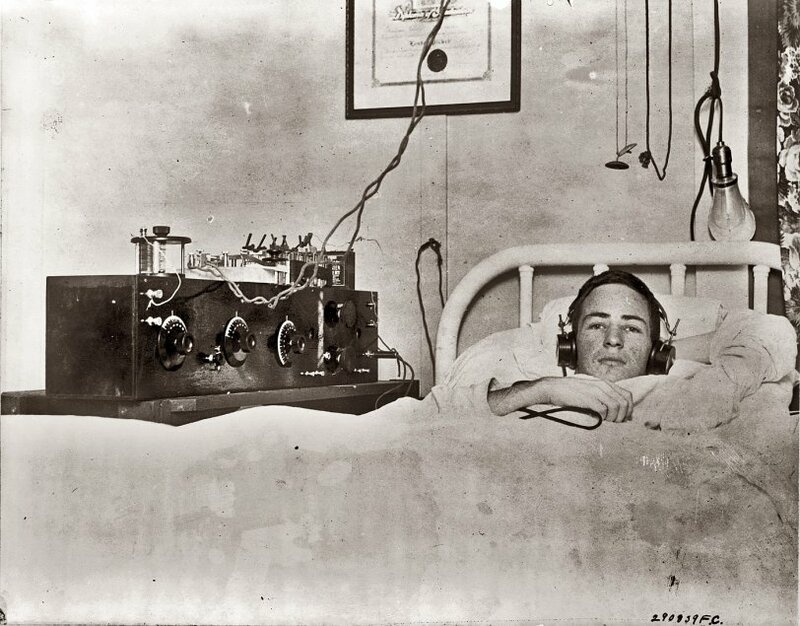 Picker would not be lying there with that ache in his back, but still, if it were not for radio, life would be lonely. 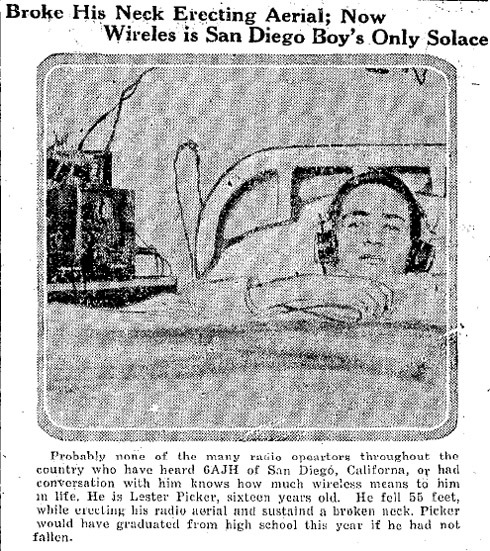 And, yes, here is another thing, too: it was amateur radio that enabled Picker to be graduated with the rest of his class at the Roosevelt Memorial High School in San Diego. The accident happened only a short time before the exercises and he was due to receive his diploma with the rest. A rather difficult situation, you might think, for a chap whose back was broken, yet the seemingly impossible was accomplished and not only is the diploma hanging on the wall, where 6ZH can glance at it proudly, but he also gave an address from the platform of the auditorium. The chair where Picker was to sit with his classmates was vacant, but who will say he was not there? At a word from Principal T. A. Russell, someone telephoned a San Diego amateur, who relayed the message by radio to 6ZH; a switch was thrown in and a hush fell over the auditorium, while the eyes of those present turned toward a big horn on the stage. Even on this eventful night, he clung to his old familiar call, and in the interval, he told of the pleasure which it gave him to be graduated with the others in his class and expressed the hope that he might join sometime his mates of ’23 and talk over experiences. And now you must wonder why Picker did not fill the chair on the platform that night. One day he was installing a new 55-foot mast at his new station and the guy wires broke. “Radio again,” you say. But now you know why the amateur radio “ops” listen when he calls. Lester Picker, 6ZH, has received his O. W. L. S. appointment and has already begun to sign his wavelength after communications. Submitted by Brent on Sun, 11/11/2007 - 11:31am. The certificate on the back wall appears to be a Diploma of something (probably Graduation but the cable obscures a couple of letters) so that's no proof of whether he's a Ham operator. What we're looking at appears to be an old three dialer with headphones for listening rather than a speaker horn - probably due to the rather primitive state of amplification in those days. Submitted by Ham Radio Curmudgeon on Sun, 11/11/2007 - 11:13am. Lester's rig looks like a single band receiver, probably the AM broadcast band. The receiver designs back then were very simple and touchy to tune. The most common three dial receiver design used three tubes to amplify the signal, the design today is called a TRF receiver. The dials didn't have kHz marks, just 0-100 logging marks. There was also a gain control that had to be constantly adjusted as the signal faded or strengthened. I used to have a very similar antique receiver, called a 'Freshman Masterpiece'. It had five tubes, three for amplifying the radio signal and two for amplifying the audio... and they were all the same type, O1-A triodes. Pentodes and tetrodes were still on the horizon. If you look on top of the receiver, you can see an array of batteries, since that was the common power source back then. There would be a -22 volt grid bias battery, a 6.3 volt lead-acid battery for the filaments (usually recharged from a windmill generator) and a +90 volt plate battery. I think his Diploma of Graduation was either from a radio school or it could have been a high school. Submitted by Anonymous Tipster on Sat, 11/10/2007 - 9:04pm. wondering if that diploma on the wall is a Federal Radio Commission ham license? or one of the many "radio school" diplomas around back then? Does anyone have a Radio Amateur's Callbook from that era to look for the name? Submitted by Lonestar on Fri, 11/09/2007 - 7:55pm. Ah, the things that we radio buffs go through to get a signal in [or out]. Submitted by bellhalla on Thu, 11/08/2007 - 8:18am. …he finished the job, didn't he?